Its big, in fact its the biggest flying bird in Africa, its the Kori Bustard (Ardeotis kori) and one of 4 species in the bustard family. 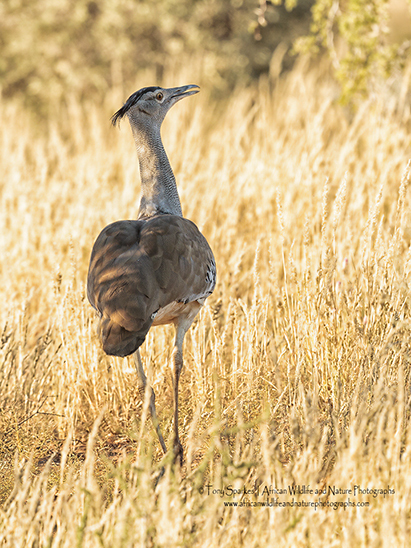 African birds come in all shapes and sizes but the Kori bustard is unmistakable not only for its sheer size but also distinctive plumage which is interestingly coloured, being mostly grey and brown but finely patterned with black and white colouring. A mainly ground dwelling omnivore (eats plants and or other animals, in this case mainly insects and small vertebrates..) the Kori Bustard can be found throughout Southern Africa where it can be seen slowly strutting through the veld in search of its food in open grassy areas, often characterized by sandy soil, especially like the Kgalagadi Transfrontier Park in South Africa but generally in low rainfall area’s. During the mating season, these birds are usually solitary but for the breeding pair. Otherwise, they are somewhat gregarious, being found in groups often including 5 to 6 birds and generally silent but when the Kori Bustard is alarmed both the male and female birds let out a loud ‘growling’ type bark.